As a number of British newspapers lead this morning with news that Britain is going to war again in the Middle East, here’s a piece – recently published at The Conversation, an excellent site co-sponsored by the University of Birmingham – which tries to set current events into historical perspective, with a focus on the 1920s. Clearly, in the wake of Chuck Hagel’s warning that the US fight against IS is not going to be “a combat boots on the ground kind of operation”, the KRG and its forces are thus the new favourite proxies in the Iraqi-Syrian borderlands. But what does the region’s history tell us about this strategy of arming minorities, including the Kurds? The Western supply of weaponry to the wider Middle East has a notoriously dense modern track record and the list of recipients includes states and regular armies, in addition to minority auxiliaries. of weapons to the Iran-Iraq war in the 1980s, meanwhile, permanently reshaped the political economy of both countries and taught Iraqi Kurds to seek ever-greater autonomy, a lesson they are now applying. But, critically, furnishing weaponry always implies a choice of fighters to pull the trigger. This in turn has historically required an effort to identify and categorise certain groups, often – though not always – “minorities” like the Kurds, as distinctively reliable, martial proxies. Who gets the guns, and on what basis, is therefore the key question. During World War I – the founding conflict of the modern Middle East and its first machine-gun war – the French and British both armed an array of proxy forces. The Arab Revolt and the Jewish Legion are well known examples. But the French also built a 4,000-strong “Legion of the Orient” in 1916, composed of Ottoman Armenians, Syrians and Lebanese. France drew the Legion’s volunteers from among Armenians fleeing the genocide against them and also from Syrians in neutral Brazil, Argentina and the USA. Shipped across the Atlantic, the latter groups found themselves deployed to fight in Palestine. Tellingly, as my own research reveals, their French officers promptly singled out the Armenians as “hardy, tough” fighters, but derided the Syrians as “vain, scheming, undisciplined and commercial individualists” – not the stuff of soldiers in other words. 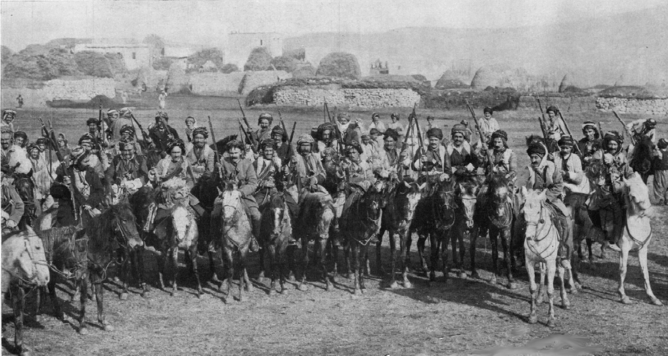 Kurdish cavalry used by the Ottomans against the Russians in World War I. Such descriptions, as historian Richard Fogarty has shown, emerged from an established colonial mentality that identified “martial races” – Sikhs or Gurkhas for the British, and Kurds, Senegalese and Kabyles (an Algerian Berber group) for the French – and disproportionately recruited them for combat. These narratives often presented martial races as whiter, manlier and more modern than other colonial peoples. And such categories had a huge influence on both the fate of those soldiers on the front lines and on the legacies of war in the Middle East. In the 1920s and 1930s, in French-ruled Syria, the emergency schemes of wartime hardened into a system that disproportionately relied on arming and training “martial” highland peoples for service as proxy forces. In 1925, for example, the outbreak of the Great Syrian Revolt against colonial rule prompted French recruitment of large numbers of Kurds, Assyro-Chaldeans and Circassians to fight against the predominantly Sunni Muslim and Druze rebels. Alawites, the group from which Syria’s ruling Assad clan comes, were often poor or landless in this era. They too, as historian N E Bou-Nacklie has documented, jumped at the chance to carry a rifle in an auxiliary unit, as the lumbering French Army struggled to match the fast-moving guerrilla tactics of its adversaries. As historian Benjamin Thomas White has argued, these recruiting campaigns did not just pick out pre-existing groups as handy allies. Instead, they actively forced groups like the Alawites into a new role as political “minorities”. Rather than acknowledging Alawite social and political diversity, for instance, the French reinvented them as a group defined in opposition to a Sunni Arab “majority”. The arming of proxies thereby helped to chop the former Ottoman populations of Iraq and Syria into ethnic-sectarian blocks. It is crucial to stress that such labels had little to do with the complex realities of people’s affiliations on the ground. But externally imposed and wrong-headed as they were, the fact that these categories brought weaponry and training to some groups and not to others meant they endured. Like the US’s institutional embedding of sectarianism in Iraq after 2003, these labels became powerful forces in the reshaping of Syria. There, the Alawites later used their influence in the military as a springboard to political dominance in the 1960s and 1970s. As weaponry and training flows to the Kurds over the coming months, and the KRG fights Obama’s ground war against the IS for him, we will be well-advised to consider the effects of this lethal largesse not just on the front lines, but on the political anatomy of the Iraqi and Syrian nation states in the years to come. Simon Jackson does not work for, consult to, own shares in or receive funding from any company or organisation that would benefit from this article, and has no relevant affiliations.